You Are Invited to a Book Forum! Response is hosting an on-campus forum on April 14 to discuss Frederick Buechner’s book, Now and Then featured in the Autumn 2003 Response. Find out more. He not only ran one of the country’s most successful companies, but he also set a new standard for principled business leadership. 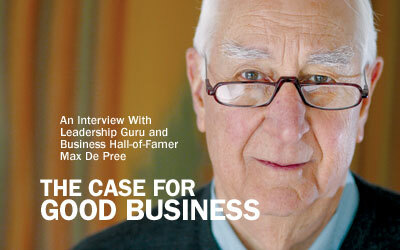 Max De Pree, chairman emeritus of Herman Miller Inc., tells Response how his faith shapes his philosophy of business. What does it mean to bring integrity to bear in the marketplace? Five leaders provide inside views of the challenges and rewards of doing the right thing in business. Though he is officially the co-owner of Oak Harbor Freight Lines, Alumnus of the Year Ed Vander Pol ’72 says his company “belongs to God.” The trucking operation delivers goods — and goodwill — throughout the Pacific Northwest. When Chris and Alice Canlis and their staff prepare for another evening at the legendary restaurant Canlis, they tell each other stories. In 54 years, the Seattle institution has offered its own brand of personalized service to thousands of guests. John Rhys-Davies — Gimli in “The Lord of the Rings” films — came to SPU in January for a celebration of Tolkien's masterpiece. In a series of events, students explored ties between the epic story and the challenges of Christian discipleship.